Historic New England’s Collections Care Project is moving right along in its second phase. Staff members are happily cleaning, photographing, and updating catalogue records for all of the objects that have been moved into temporary storage, which paved the way for upgrades to permanent collections storage in Haverhill, Massachusetts. Right now, we are focusing on ceramic vases, dinner sets, tea sets, coffee mugs, and small decorative objects. 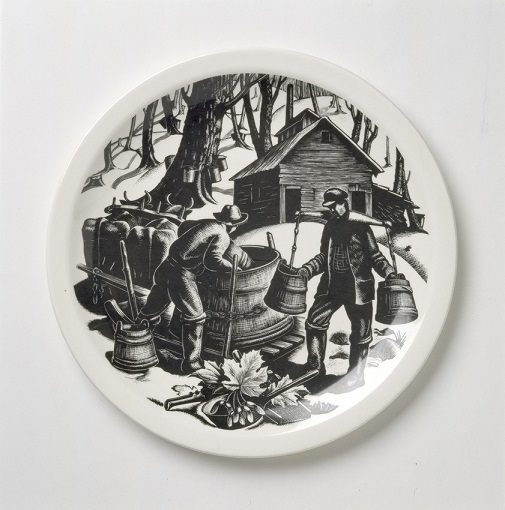 In the 1950s Wedgwood began to manufacture dinner plates using the wood-cut block-prints of artist Clare Leighton. 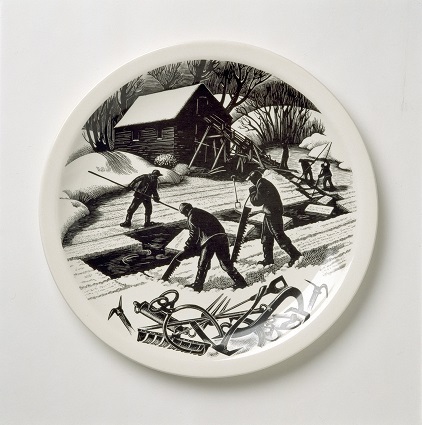 Leighton (1898-1989) was known for her depictions of working-class men and women plying trades that were disappearing in the post-World War II era. This set of twelve depicts New England industries including cod fishing, cranberrying, farming, grist milling, ice cutting, lobstering, logging, marble quarrying, shipbuilding, maple sugaring, tobacco growing, and whaling. If you enjoy objects that tell the stories of our region’s history, please help us preserve our unparalleled collection with a gift to the Collections and Conservation Fund.